This week on Designers Book Shelf I got a lot of reading suggestions for you. Every week I will be posting new suggestions of books for designers and everyone that loves design and art in general. Check out what I have for you this week and stay tuned for more next week. 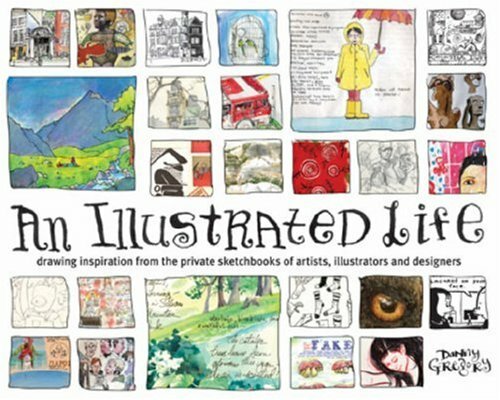 An Illustrated Life offers a sneak peak into the wildly creative imaginations of top illustrators, designers and artists from around the world through the pages of their personal visual journals. Popular visual journalist and author Danny Gregory reveals how and why keeping a consistent, visual journal leads to a more fulfilling creative life. Designers and artists working in all mediums will find creative inspiration from these insightful interviews and stunning examples. (amazon) Danny Gregory has done it again. He's nurturing and encouraging people from around the world to draw the little treasures of their lives. This book is a celebration of that special part of us that needs to draw, record, interpret, and play! When I got my copy, I was drawn like a magnet into the pages. This is a book that can be read and savored for a long, long time. There is so much, and it is all so rich. I carry it around with me throughout my day. Just looking at the beautiful cover makes me smile in anticipation. The 50 artists have very different styles and approaches, which I found broadening. It is so much fun to read about their approaches, supplies, and ideas. I have taken a magnifying glass to some of the images already, so I can marvel at the smallest of details. I have found myself hoping that Danny Gregory will create a sequel - or - hopefully, a series of these books. An engrossing read. Buy it...you will love it. While you're at it, buy a moleskin or other journal because you won't be able to stop drawing! 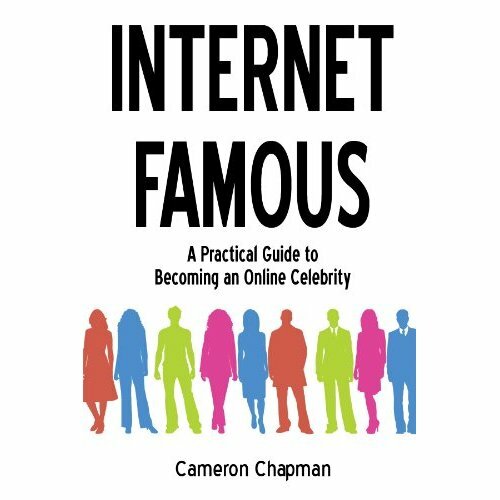 Internet Famous is the complete guide to making your name known online. With chapters covering everything from the basics of what Internet famous is to the different types of social media to creating your own plan to gain online fame, Internet Famous has all the information you need to become an online celebrity. Whether you want to be famous to help sell a product or service, to promote a cause, or just because you want people to know who you are, this book will give you all the tools you need to make it happen. When Photoshop guru Matt Kloskowski was asked why he wrote this book, he replied, “It’s simple: I wanted to write the Photoshop book that I wished was around when I was learning Photoshop”. You’ve always known that layers were the key to understanding Photoshop, and now you have a resource to show you exactly how. With Matt’s clear, easy-to-follow, and concise writing style you’ll learn about: * Working with and managing multiple layers * Building multiple layered images * Blending layers together * Exactly which of the 25+ Blend Modes you need to worry about (there’s just a few) * Layer Masking and just how easy it is. * Using layers to enhance and retouch your photos * All of the tips and tricks that make using layers a breeze. 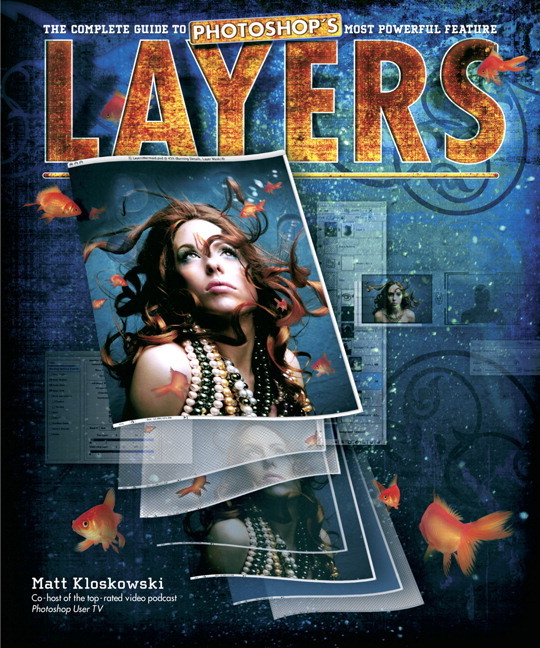 If you want to finally understand layers in Photoshop, this book is the one you’ve been waiting for. (amazon) I'm one of those Photoshop users who knows too much to want to read a book mainly for beginners, not because of ego considerations but because I would be bored and skip around. But there are also huge gaps in my haphazard Photoshop education. This book gives absolute beginners what they need without slowing down the more experienced user. It's long enough to cover what it aims out to cover without being so long that you look at it and say, someday I'm going to go through that book but not today. I was attracted to this book because of who wrote it (I watch Matt's Killer Photoshop and Lightroom tips all the time), the topic, which of course is central to knowing Photoshop, and because of the great cover. I'm a small press publisher and believe me, covers matter. Many good books languish because they don't appeal initially to the eye. And a Photoshop book should have a good design. It's also well-edited, a welcome plus in today's publishing world. Anyway, what's between the covers is just as delightful. I think the word I would use to best describe this book is methodical but not in a boring way. It's comprehensive, but the way it's laid out never overwhelms you. I know that when I go through this book a couple of times, I'm going to be flipping my way through layers like a maniac but a maniac who knows what she's doing and knows what layers can do for her. And, I LOVE the last page of each chapter, the "How do I...." question and answers. It gives me one place to go to immediately find all those absolutely essential shortcuts and critical pieces of knowledge without which one wouldn't really be able to say they had a good basic understanding of layers. Matt even has two companion videos on the book's web site and you can download all the images used in the tutorials there as well. I may not be an expert in Photoshop (yet) but I do consider myself an expert on Photoshop books and this one is well worth the very reasonable price. Have fun playing with it; I am! Critically authoritative visually stunning and physically massive Art of the Modern Movie Poster is the first and last word on post-WWII film poster design. Showcasing fascinating examples from 15 nations this collection of more than 1 500 exemplary designs is a must-have for film buffs design and poster aficionados alike. The posters are organized by country of origin offering an intriguing glimpse into each region's unique visual sensibility and sometimes unexpected takes on familiar films. Gathered from the renowned collection of the Posteritati Gallery in New Yorkóone of the largest holdings of international film posters in the worldóthis volume is the definitive survey of both film and popular graphic art in the modern era. (amazon) Huge book that tries to cram in every movie poster ever made. This book is about the "art" of the movie poster. If you are looking for a great film with bad poster art, it probably will not be in here. This book is more than a book on movie posters, but a great book on graphic design! Anyone going into advertising or graphic design has to have this book! The only problem I have with the book is it's lack of coverage given to American and Independent film posters. I think there is way to much coverage given to foreign movie posters. Having said this, you will find that the foreign poster art really is amazing and gives the film a whole diffrent "feel" than the Americian poster art that we are used to. All in all, you will find poster designs for movies that you have never seen before. 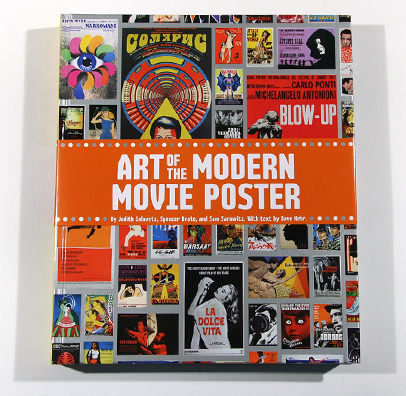 Last, but not least, the book is an excellent refrence/shopping guide to the wonderful world of movie posters. Berlin Design Digest is a new design book that showcases work from 75 Berlin agencies. Berlin is a creative hot spot. Behance has been a source of inspiration on the web for the past 8 years, I remember when they first started back in 2007 and it's amazing to see how important it became to the design community. That's also one of the reasons that Adobe acquired them.